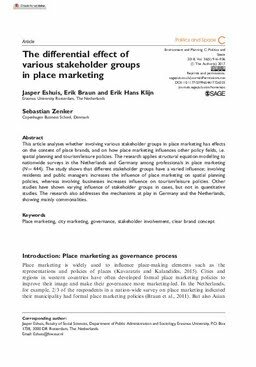 This article analyses whether involving various stakeholder groups in place marketing has effects on the content of place brands, and on how place marketing influences other policy fields, i.e. spatial planning and tourism/leisure policies. The research applies structural equation modelling to nationwide surveys in the Netherlands and Germany among professionals in place marketing (N = 444). The study shows that different stakeholder groups have a varied influence; involving residents and public managers increases the influence of place marketing on spatial planning policies, whereas involving businesses increases influence on tourism/leisure policies. Other studies have shown varying influence of stakeholder groups in cases, but not in quantitative studies. The research also addresses the mechanisms at play in Germany and the Netherlands, showing mainly commonalities.